The Leinster Rugby section in the IRFU Girls x7s competition has come to a close and Gorey Community School, the current National Champions have qualified again this year with their senior team and have a junior team competing also. The first area qualification event on 26 September, kindly hosted by MU Barnhall, saw six senior teams compete for three places. St Oliver’s school from Oldcastle, Co. Meath and Scoil Mhuire in Clane did well to take the top two spots. The third school to qualify for the National Finals was St Kevin’s, Dunlavin, which is made up primarily of Naas RFC players and boasts several Leinster Rugby U18 squad players. In glorious sunshine at County Carlow FC on 27 September, Gorey CS, Tullow CS and the newly involved East Glendalough College came out victorious and also earned their places in the National Finals at Energia Park on 7 November. This prestigious event, which is undoubtedly the competitive highlight of the girls’ schools calendar, attracts schools playing in the top tier of girls rugby in Leinster and is always keenly contested. The addition of a Junior Section in the competition for two teams per province has added a new level of depth and excitement for schools. The juniors had to qualify from two blitz events to make the finals. In Naas RFC, on 11 October, The King’s Hospital and Gorey played passionate rugby to take the two available places ahead of St Kevin’s and Tullow CS. Naas RFC kindly hosted the third day of the competition as Leinster Rugby included a ‘player development’ section for the six qualified senior teams and the final four junior teams for the first time. Top coaches and rugby staff from Leinster Rugby, including CRO Joe Carbery, Leinster Rugby Women’s Head Coach Ben Armstrong, and Ireland international Larissa Muldoon, covered three different topics with the players on the pitch in the game-based skills training. The girls benefited from a presentation on the IRFU’s Eat2Compete online facility by Women’s Development officer Jennie Bagnall, and an inspiring presentation by Larissa Muldoon, Leinster’s newest Development Officer whose role has a focus on the female game in the Metropolitan Area. 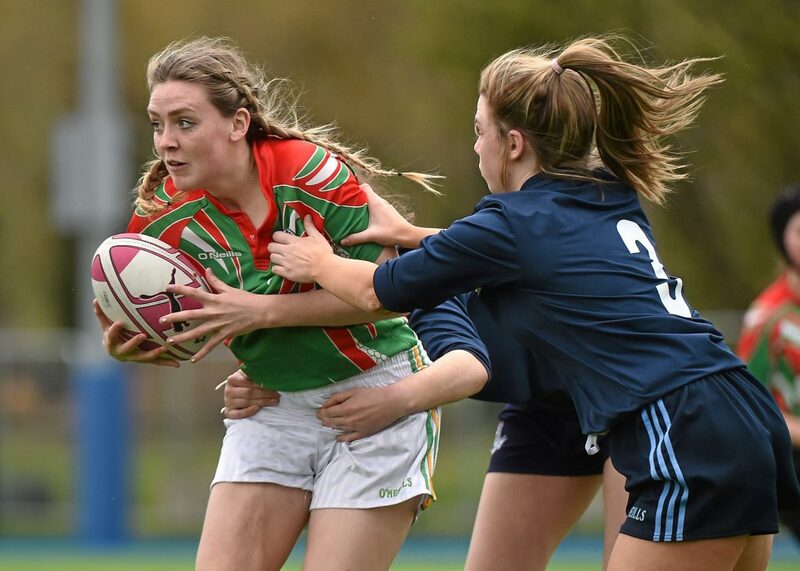 “It was great to see so many schoolgirls participating in the X7s blitzes across Leinster over the past few months,” said Muldoon, who attended the qualifying events as well as the player development day. “Loads of schools took part in both junior and senior games. These events just show how much the girls’ game is growing and the demand for girls rugby in all schools across Leinster. The eight teams below will represent Leinster at the IRFU National Finals at Energia Park on Wednesday, 7 November.